Holiday home for max. 8 persons in Northwest Estonia where some of the most beautiful sandy beaches in Estonia are located. The distance from the cottage to the sea and beach is ca. 1,5 kms. There are beautiful pine woods with berries nearby. The area is appreciated by bird watchers. Peräküla beach which is appreciated by surfers is ca. 6 kms away. Hiking and running tracks nearby offer lots of possibilities for sporting. The cottage is on two floors. 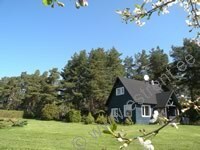 On the ground floor there is a kitchen, living room, two bedrooms, sauna, WC. Direct access from the sauna to the terrace with possibility of sitting and resting. Sauna. Garden. Possibility of barbequing. Smoking oven. Wireless internet (WiFi) 200 m away (by separate agreement).